Well, I can see that this would appear tragic from most angles, but it's working out okay for me. 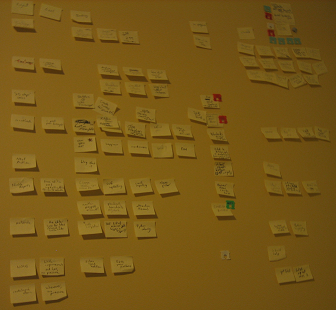 I setup the kitchen at home to have an 'agile' story wall, for managing my software hobby projects. This was only a temporary arrangement (no way would Mrs SecretGeek allow me to permanently comandeer a wall in any of the liveable areas of the household, you understand.) The kitchen was briefly devoid of furnishings, while we had the floor repaired. And while the room was in this bare state, there was a big empty wall staring at me, just daring me to use it up with some ridiculous leon ideas. So I turned it into a story wall to manage all the little hobby projects, web-sites, and applications, that are fighting for my nonexistent spare time. The workers who repaired the kitchen floor probably realised there was a freak in the house. I can handle that. 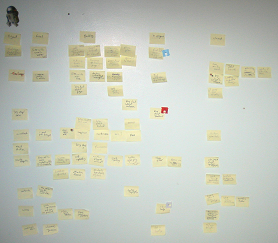 Along the top I put headings, "Project", "Goal", "Backlog", "In Progress" and "Closed" (see orange arrow at right). 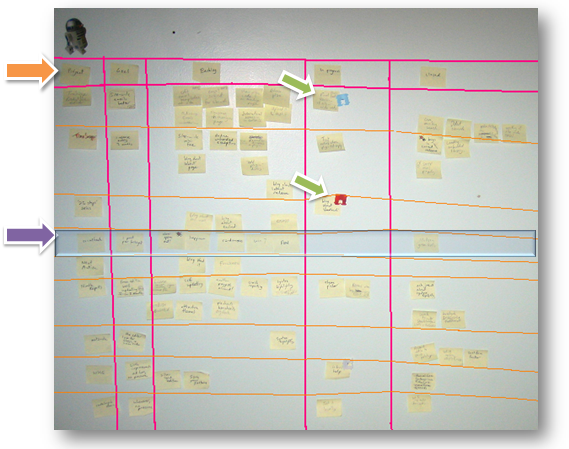 Each project forms a swim lane of its own (shown by purple arrow in picture at right). I seem to have 9 projects in flight at the moment. Blue is the 'next-action' -- it's whatever task is top of mind at the moment. (This lets me have multiple projects that are officially in progress, when only one can really be the winner -- usually TimeSnapper). A red bread-tie indicates a task on which i'm blocked, stuck, making no progress. Green is stuff that I must ask Mrs SecretGeek to do for me. (She is my chief financial officer). The little cardoard-cutout of R2-D2 seems to have disappeared in the move. A certain toddler will need to be interrogated, Darth Vader style, on its whereabouts. And here's a similar article from my colleague Ben Arnott, Fatherhood, People Leadership and Agile, where he admits using Agile to manage the kids. In response to this, someone else at work admitted, very sheepishly, that she uses Agile-style retrospectives at home. There was also an elegant code podcast episode covering this talk: Agile Practices at Home: Iterating with Children from Agile2009. Makes me wonder how many people are secretly using these kind of techniques at home with their kids and partners, without having the guts to talk about it in public. Ever taken your work home in this way?